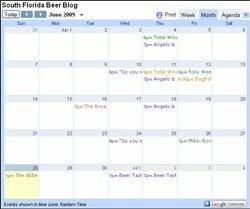 I have now added a Beer Events Calendar at the bottom of the page. I will be trying to update the calendar as frequently as possible with any new events I hear of. If you know of any going on around South Florida be sure to get in touch with me and let me know and I will add them to the calendar.